MUNICH (Panorama): The second stage of this year’s Sport Management field trip through Germany and Austria awaited the students with a real highlight – and some lessons in Bavarian. After three days in Mainz and Frankfurt, the 16 Sport Management master’s students from HiMolde and 15 students from Johannes Gutenberg University of Mainz headed on to Munich. As the previous days filled with lectures sapped both physically and mentally, the free afternoon in Bavaria’s metropolis was more than welcome to prepare for the upcoming tight program. 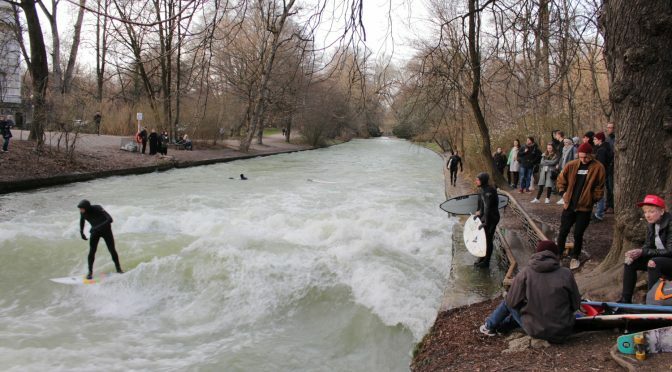 Even though it was a day without lectures, sport was not to be missed and we had the chance to watch some brave surfers riding in the 5°C cold Eisbach river. The next day, we went back to “serious business”, namely football and that in one of the most glamorous venues: Allianz Arena, the home of FC Bayern Munich. Sitting on the substitutes’ bench and eying the uncountable trophies in the exhibition hall gave us the chance to scent some real UEFA Champions League air – but not for long, since the schedule was tight and we had to move on to the next visit at the Bavarian Skiing Federation. Time to relax? No chance! At least now, the motto for the trip was clear: “We don’t have time to eat, you can get food for thought!” And the next food for thought was a bit heavy-going, since the presentation about the governance of the federation and the organization of the annual team clothing event was held mainly in German. But thanks to our German-speaking students and Prof. Dr. Holger Preuss from Johannes Gutenberg University, everyone could understand the main points. Still assimilating the information about Bavarian winter sports, the next course of our brain food was just ready to be served: visit to Audi Dome, the current home of Bayern Munich Basketball and the former Olympic basketball hall of the 1972 Summer Games. As the name says, the German car company Audi is a strategic partner of the club and thus, besides a guided tour through that historical venue, the creation of brand experience through sport events was a key aspect of that lecture. Editor’s note: Part 1 was published Friday, and Part 3 will be published Tuesday.